Although a mortgage enables you acquire what is probably you most valuable asset, your home, it is a burden that most people bear grudgingly. First there is the monthly mortgage installment that never seems to end, the mortgage balance that goes down ever so slowly and the constant worry of what would happen if you lost your job. It is no surprise therefore that most people would be more than happy to pay off and be done with their mortgage if they had the chance. But would that be the wisest thing to do? Let us look at the things to consider before paying your mortgage off early. Please CLICK HERE to watch on You Tube. It used to be that you worked hard, paid your mortgage and celebrated when you finally cleared it. In fact, most people did not consider the house truly theirs until they had paid off the mortgage in full. That doesn’t happen too much these days. Very few people stay in their home long enough today to pay off a 20-year mortgage. If you can pay it off early, it might be the best way to spend your money. There is a security found in owning your own home. With every year that passes, we count how many years until the place is free and clear. You can make extra payments on your mortgage to pay it off quicker and save thousands of shillings in interest. For example, a Sh 10 million, twenty year mortgage at 14% interest has a Sh 124,352 monthly installment. Paying an extra Sh 12,400 per month would result in you clearing the mortgage in 166 months instead of 240. 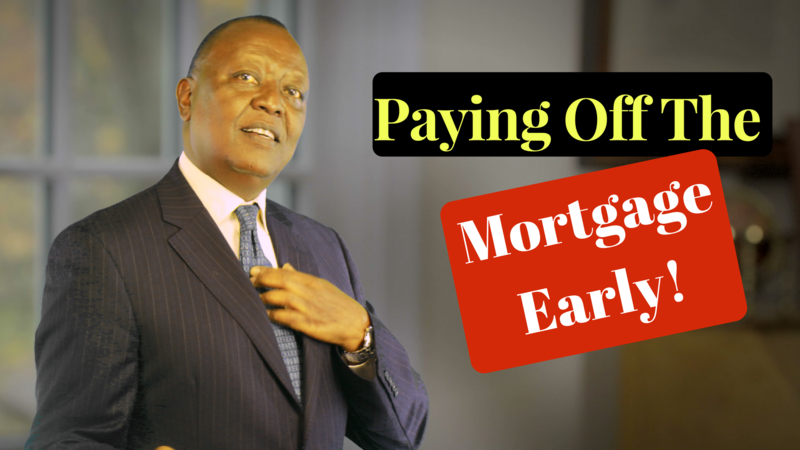 Therefore simply by paying Sh 12,400 extra, you clear the mortgage six years ahead of schedule! You would also save you over Sh 7.2 million in interest! That’s a lot of money that you could spend elsewhere. But there are a lot of arguments against paying off your mortgage early. Long-term mortgage rates are around 18% for most homeowners. If you deduct the interest paid from your taxes, the actual rate you are paying is closer to 16%. Any investments that earn more than 16% are a better place for your money. Please CLICK HERE to watch on You Tube. The first is preparation for retirement. You need to focus your extra money towards your retirement before you pay off your home. Owning your own home won’t mean a thing if you do not have money for medication and food. Saving for retirement should especially be important if your mortgage is scheduled to be paid off before you retire anyway. If you have others who are dependent on you, it is more important to have adequate life insurance coverage than to prepay your mortgage. Your family’s needs should be addressed by your policy. Make sure that you have enough coverage to take care of your family. Another important consideration is an emergency fund, that is, having enough money in a savings account to cover three to six months’ worth of expenses, including your mortgage payment. This will help prepare you for any emergencies that might come your way. For example, if you break your arm and cannot work for two months, your loss of income will be covered by your emergency fund. On the smaller side, a broken dishwasher or vehicle won’t stress you out as much if there is money designated for repairs. And don’t even think about paying off your mortgage if you have high-interest debt somewhere else. Always pay off your credit cards first. Extra money goes to the loans with the highest interest first as a general rule of thumb. There are some homeowners who really benefit from paying off their mortgages early. If you have a small mortgage and don’t deduct your mortgage interest, the actual cost of your mortgage is higher. Paying off your mortgage is a good idea. Many lenders will encourage the payment of a mortgage early. When you make extra payments to your mortgage, make sure that the extra payment amounts are applied to the principal of your mortgage. Also, make sure that your agreement contains no prepayment penalties. I am proud of you if you are in a place where you can pay off your mortgage early. The idea of not having a home without a mortgage payment is a wonderful one. Look at where you are, where you are going and how you will get there before you decide where to apply your money. Have yourself a great week! Please CLICK HERE to watch on You Tube.